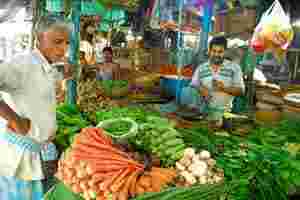 New Delhi: India’s annual food inflation eased to its lowest in nearly three-and-a-half years in late November, driven by a sharp fall in prices of vegetables and protein-rich food, bolstering the case for a pause in rates when the Reserve Bank of India (RBI) reviews policy next week. New crop arrivals in the market have broadly pushed down vegetable prices, with potatoes leading the fall with a more than 4% drop in the latest week. Prices of protein-rich items like eggs, meat and fish also fell by more than 1%. The annual fuel inflation remained unchanged at 15.53% in the latest week, data showed. “There are seasonal advantages in place which explains the declining trend in food inflation. This was expected, but the only issue is this could partly be offset by the impact of the weak rupee on core inflation," said Shubhda Rao, chief economist with Yes Bank. “I still expect November (headline) inflation to come in at 9.04%," Rao said. The government will release October’s industrial output data and November’s headline inflation data next week. “I would still bet on a pause in the December review," Rao said, adding, if October’s industrial output growth slumps, and if other macroeconomic indicators continue to disappoint, the RBI could cut rates as early as in January. India’s headline inflation has stayed stubbornly above 9% for the 11th month in October, despite 13 rate increases by the RBI since March 2010. “If food inflation is collapsing, it will feed into other inflation very soon. So my view is that we are in a position to cut rates today," said Surojit Bhalla, chairman of Oxus Investments, a Delhi-based consultancy firm, earlier. “In my opinion, the past two rate hikes were unnecessary and applied because of the RBI’s ludicrous obsession with the spot level of inflation. Worse still, they have barely started to feed through," said Patrick Perret-Green, head of forex and local markets strategy for Asia at Citigroup said in a note. India’s benchmark 10-year bond yield briefly fell as much as 3 basis points to 8.50%, following the weekly price data release. In its October review, the RBI had said if inflationary pressures started to abate by December, more rate increases may not be needed. The RBI had said that taming food inflation also needs supply-side responses and had indicated that the government needed to do more to smoothen supply-side responses. India suspended on Wednesday plans to open its $450 billion supermarket sector to foreign firms such as Wal-Mart Stores Inc , backtracking from one of the government’s boldest reforms in years in the face of a huge political backlash. Various government officials had said that allowing foreign direct investment in multi-brand retail could have eased supply-side bottlenecks and tamped down on food inflation which is typically outside the purview of monetary policy.